Starting from the hotel and going on the left there is via Stalloreggi, the same street walked by the Medieval pilgrims that came from Grosseto. Then, passing under the arch of Due Porte there is the city entrance, originally with two archs, that was a part of the ancient city walls of Siena. 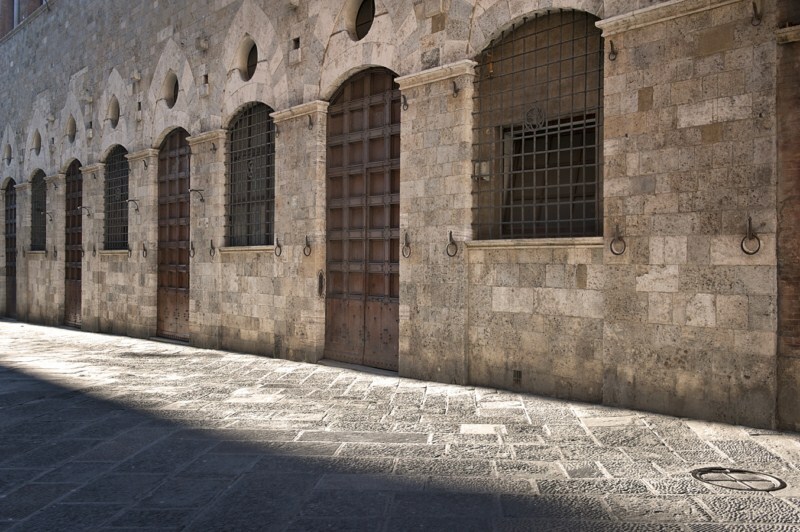 Along this street you can see, on the right, the Mocenni’s house, where the founder of Senese painting school, Duccio di Buoninsegna , painted at the beginning of XIV century (from 1308 to 1311), the greatest ar piece of the Middle Age, the Maestà (Majesty), for the main ar of the cathedral and now hosted by the Museum Opera del Duomo. 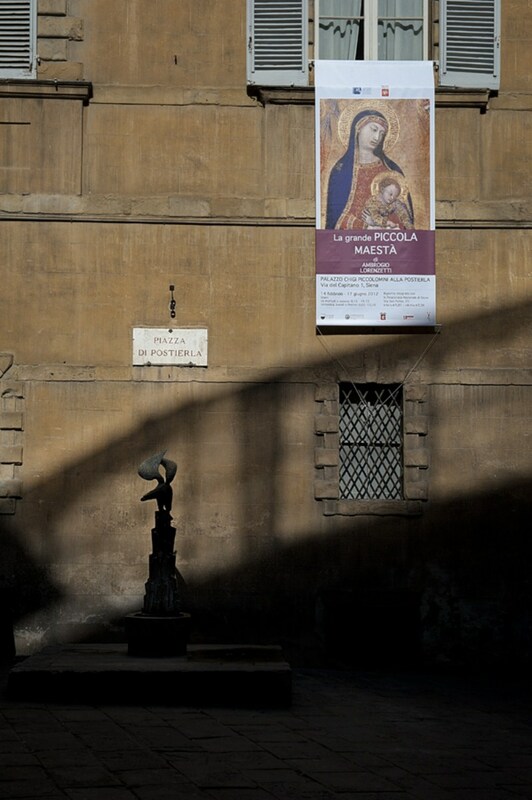 A chronicler tells that when this artwork was completed has carried in procession along the street, from the painter’s house to Piazza del Campo and the cathedral with many people: musicians, prelates and children. 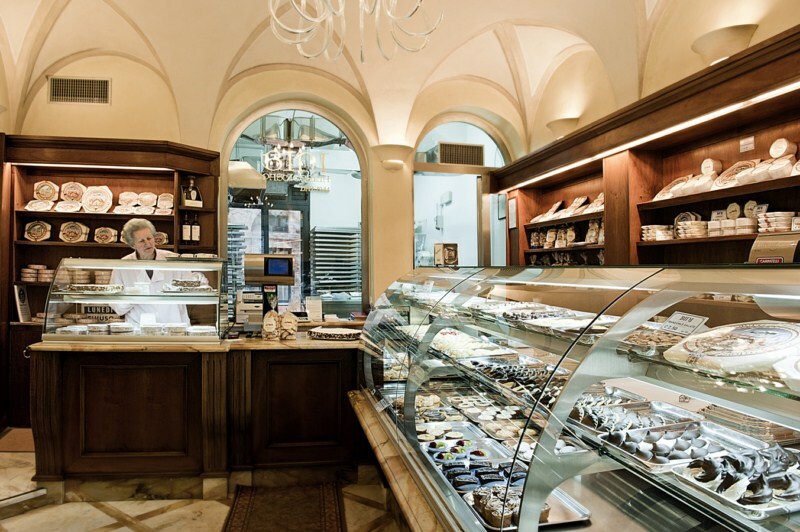 During the procession some typical sweets were offered to children: cavallucci, ricciarelli, cantucci, probably the same sweets that you can find at Pasticceria Bini, next to the ancient workshop by Duccio. 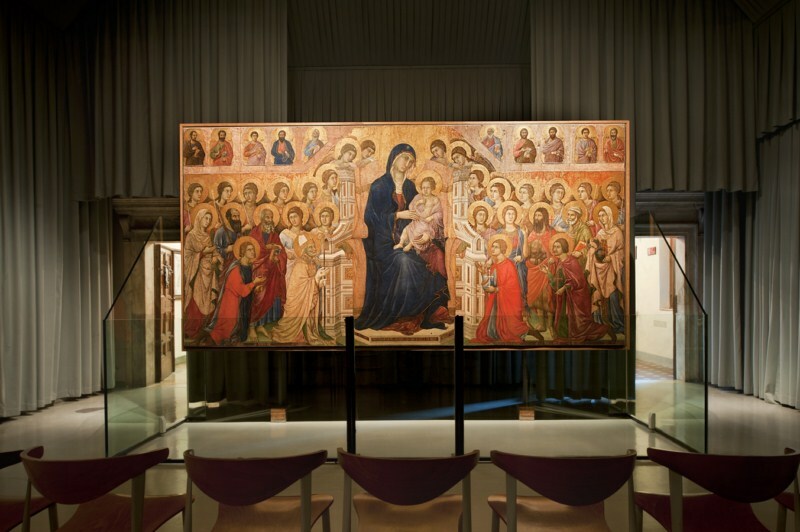 Proceeding on the left there is a workshop of Jewish painting. 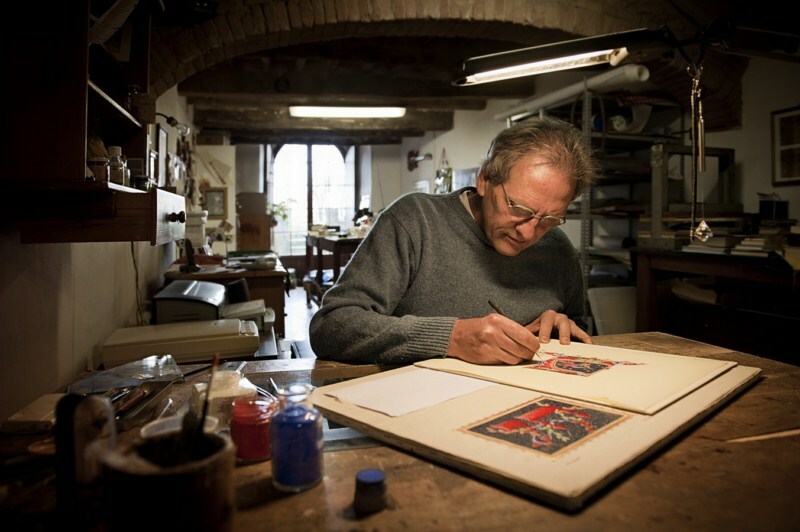 In the area of Panther’s contrada, we meet on the right the workshop of a painter who makes duplicates of Sienese paintings from XIV and XV centuries. After the bronze Panther’s baptismal fountain, on the right, we reach Postierla square, also named “I quattro cantoni” (The Four cantons). 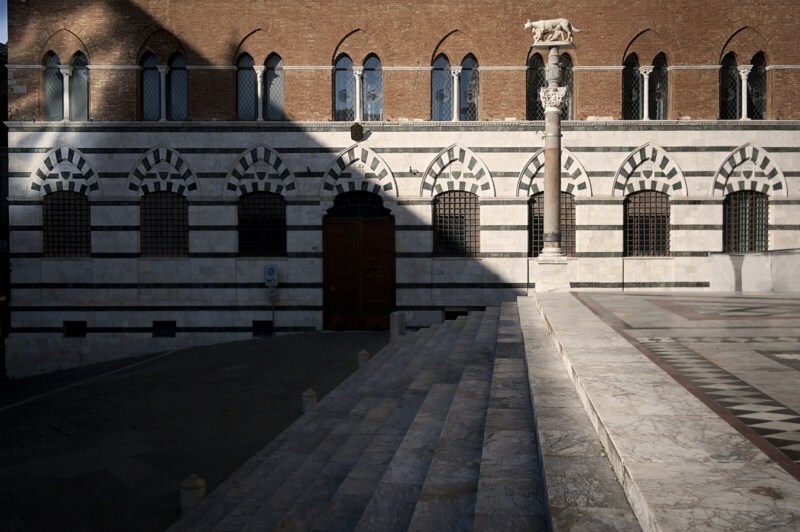 In the middle of the square, in front of the small fountain of Eagle’s contrada, there is a column with a she-wolf, symbol of Siena and its Roman origins. 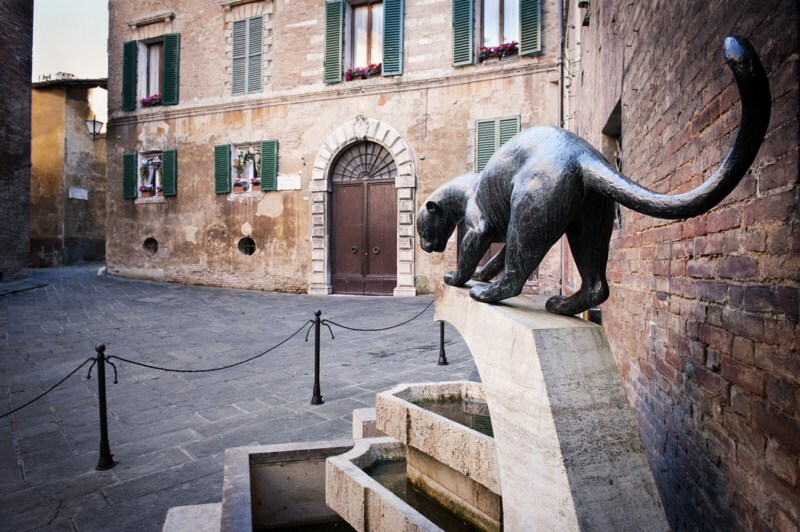 The original she-wolf was by a Senese sculptor from Renaissance, Federighi, but was removed and now, above the column, there is another canine sculpted by the Tuscan sculptor Giuliano Vangi during the Nineties, in the last century. 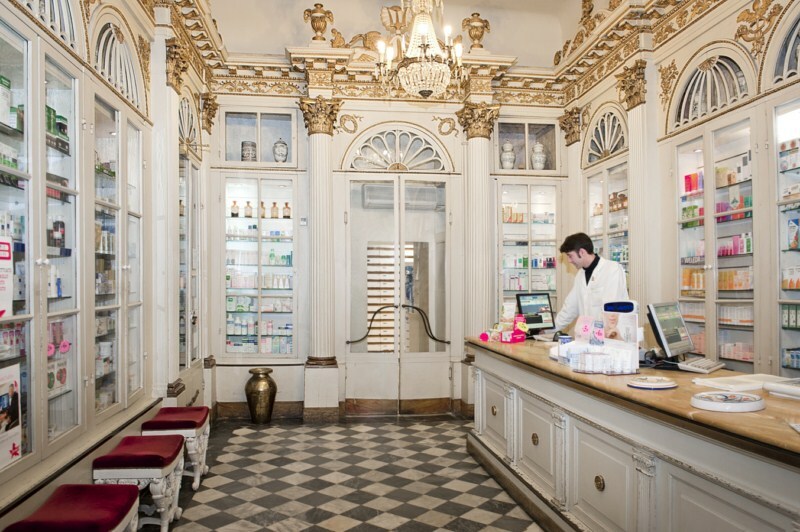 We suggest you to go to the Four Cantons Pharmacy in Postierla square and admire its shelves and its ceiling in Egyptian style. These are furnitures from 1830, designed by Agostino Fantastici, a brilliant Senese architect that first spread the Empire style in Italy. 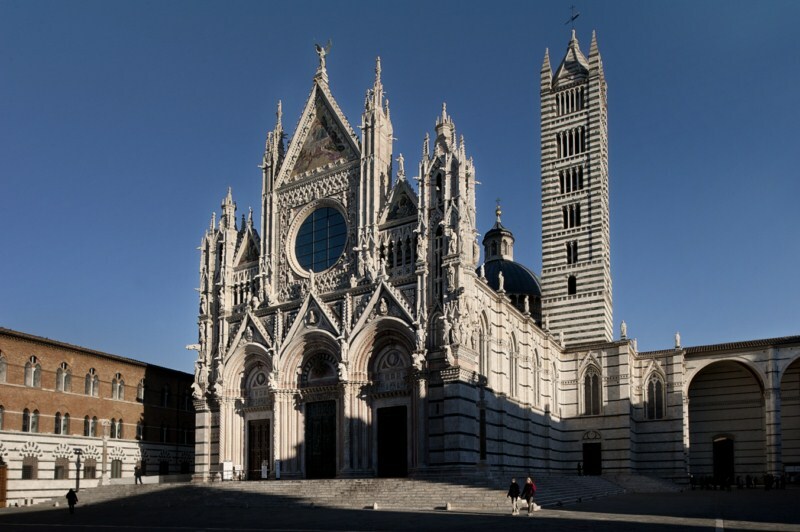 From via del Capitano, between neo-gothic palaces and souvenir shops, we arrive in front of Cathedral. Henry James wrote “There is more of this goldsmith’s work in stone than I can remember or describe; it is piled up over three great doors with immense margins of exquisite decorative sculpture”. 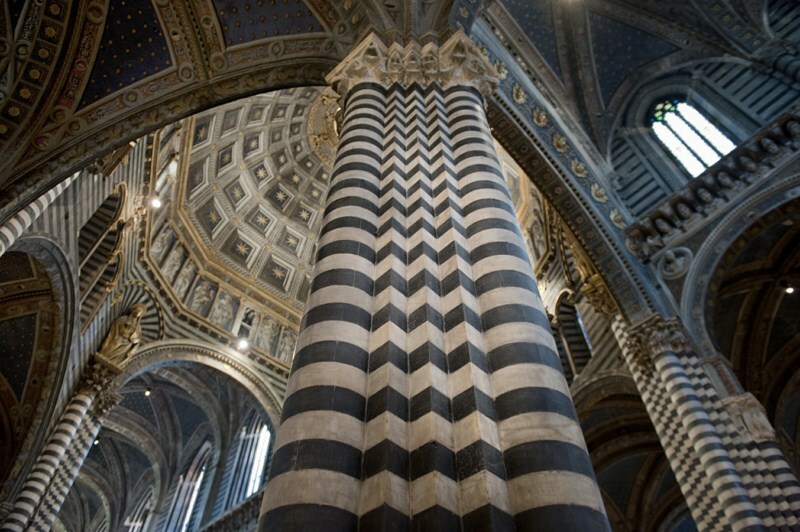 The Duomo, founded on a pagan temple dedicated to Minerva just like almost all the European cathedrals, dates back to XIII-XIV century, with an amazing facade and interior constructed of white and greenish-black marble, in fact the American journalist Howells called it the “Saint Zebra”. 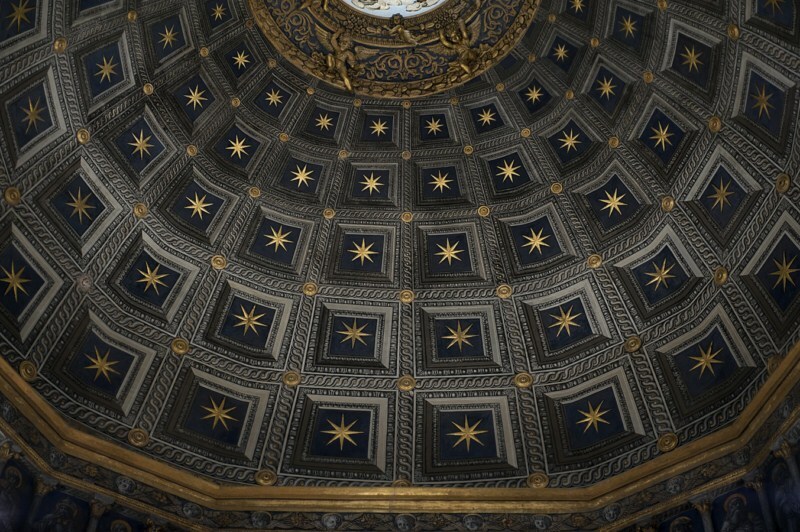 The Duomo is a precious jewel box that contains unique artworks from XIII century, as the Pulpit by Nicola Pisano, from XVI century (the Piccolomini library), from Baroque, as the Chigi Chapel designed by Bernini, and from XIX century (floors inlaid by Alessandro Franchi). 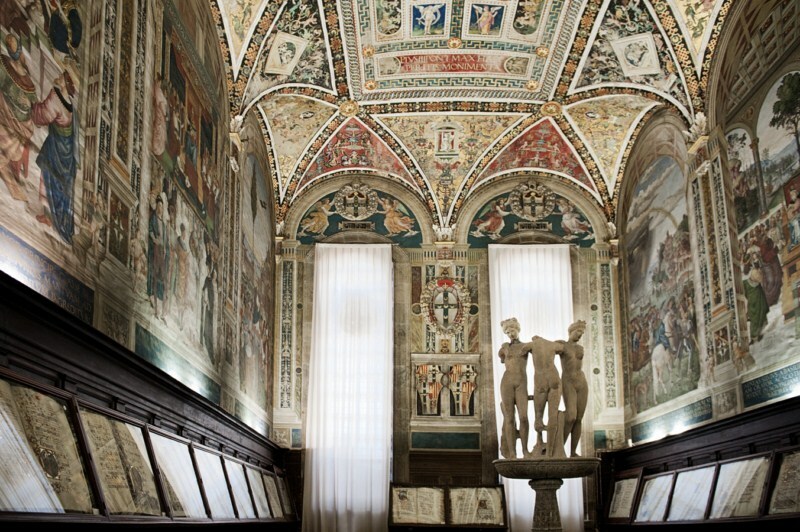 The Piccolomini library is decored by frescos of Pinturicchio, that was helped by Raffaello (that was 17). 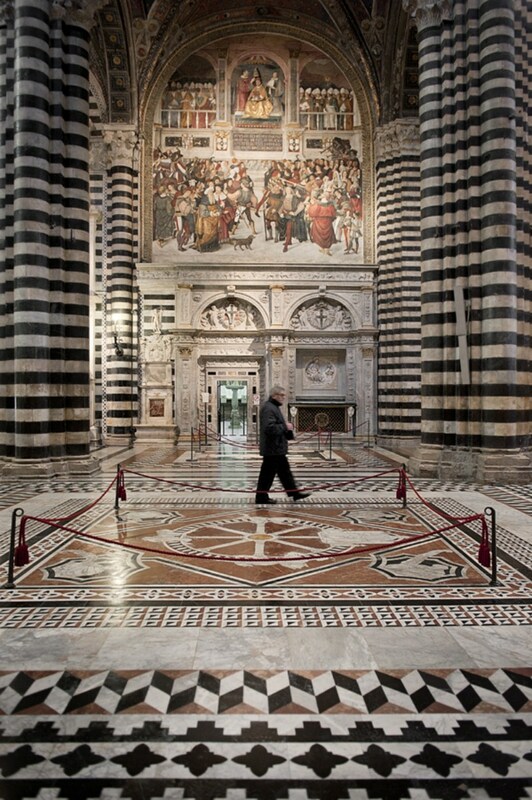 The frescos subjects are the Piccolomini family and Pope Enea Silvio Piccolomini, Pius II, a humanist and expert of classical and pagan culture. 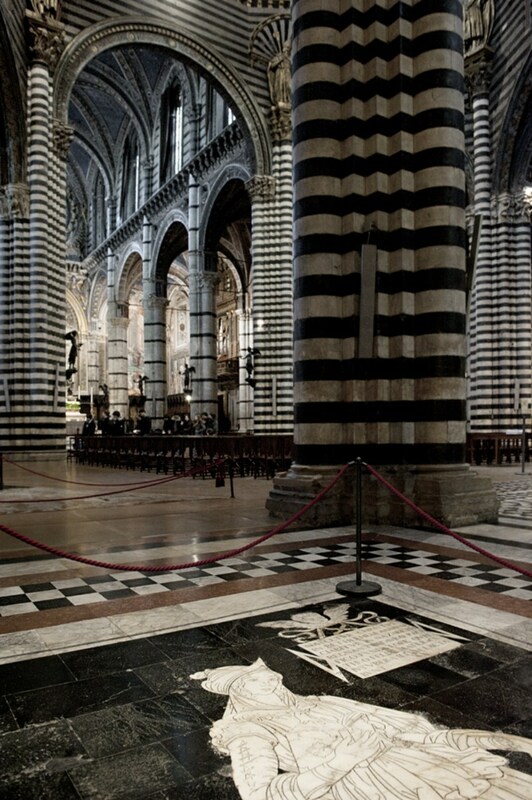 The real “wonder of Siena”, as wrote the art historian Hobart Cust from Oxford, is the inlaid floor, the result of work by the main Senese artists from XV to XIX century, a masterpiece that aroused the admiration of artists, literates and art lovers like John Ruskin, the collector Pierpont Morgan or the puritan Nathaniel Hawthorne. 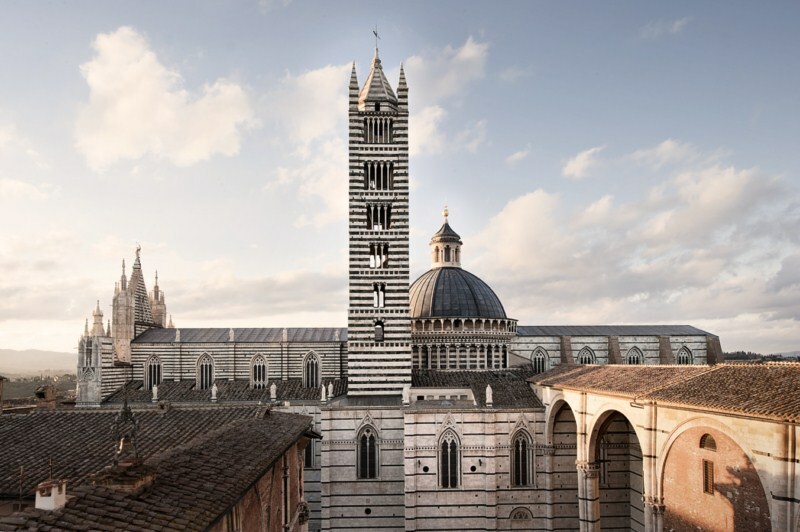 The Opera del Duomo Museum, next to Cathedral, is hosted in the area conceived as the right aisle of “Duomo Nuovo”, a widening project never completed, and now houses, besides the Maestà by Duccio di Buoninsegna, his others artworks came from Duomo. 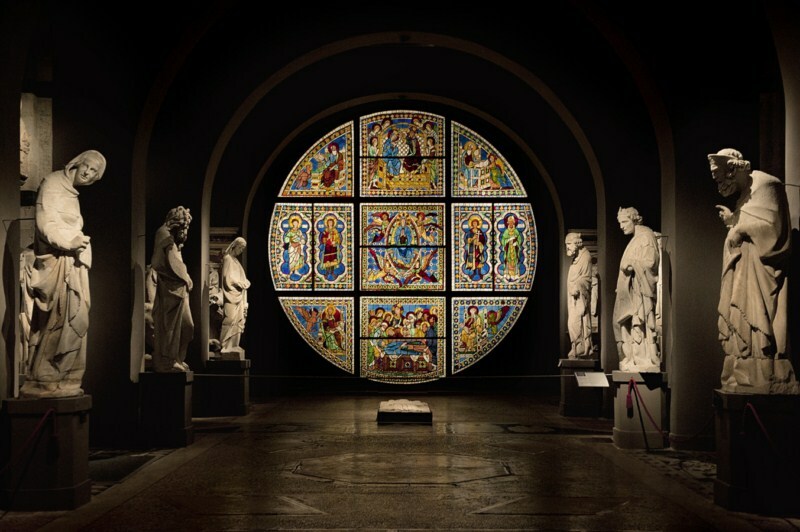 For example the stained glass window dedicated to the Assumption of Virgin it was in the apse of Duomo, and now is located in a room with the sculptures by Giovanni Pisano and Madonna of Pardon by Donatello. 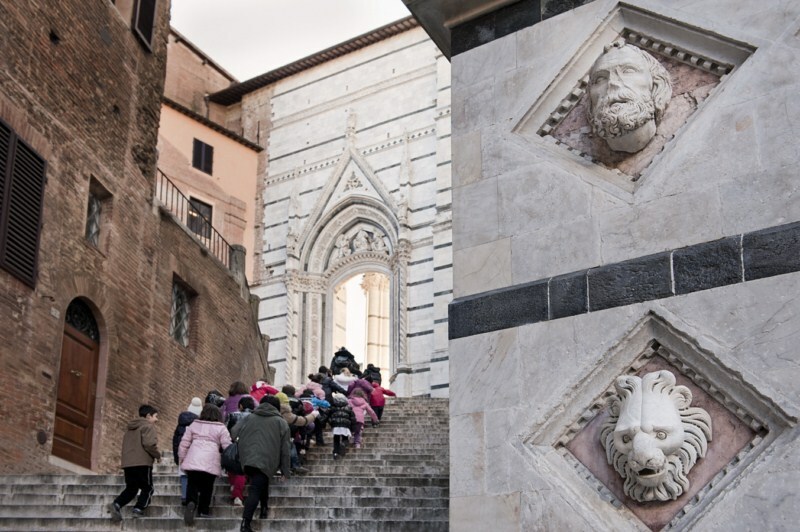 At the end of this itinerary, you can see the amazing view from Facciatone (which entrance is by the Museum of Opera del Duomo). 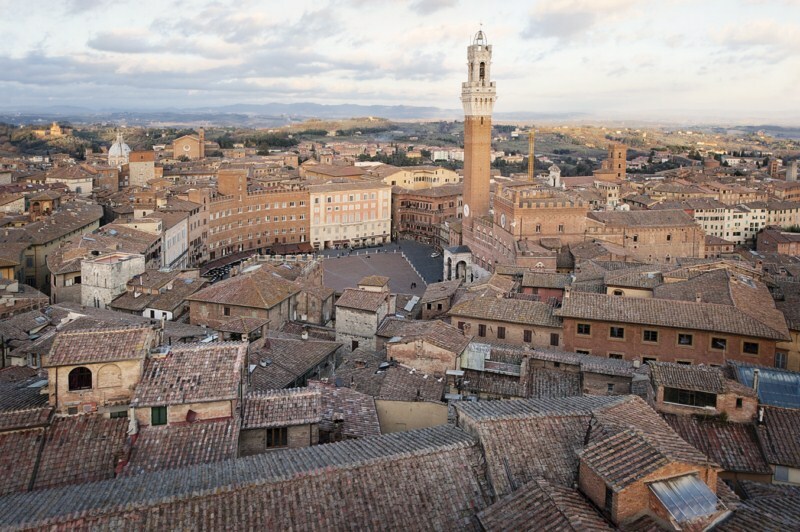 Here you can have a look at the Duomo and Piazza del Campo. 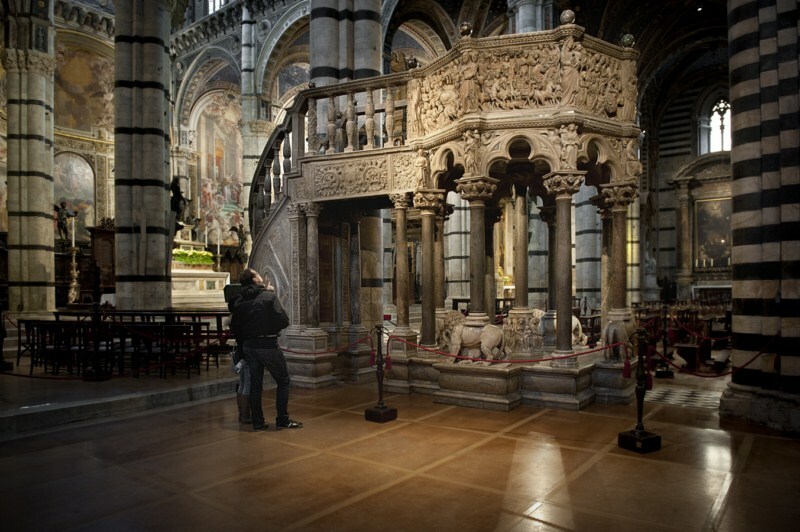 At last we suggest you a walk at the evening towards Duomo, where to enjoy its beauty surrounded by quietness at the end of the day.